William Kilburn worked as a botanical illustrator. He produced most of the plates in the first volume of William Curtis's Flora Londinensis, a field guide to the wild flowers of London. This was a serial publication that came out between 1777 and 1798. This plate is based on Kilburn's design. The original watercolour survives in the Botany Library of the Natural History Museum in London. One of the subscribers to the Flora Londinensis, Sir Thomas Frankland, wrote regularly to Curtis with criticisms and comments. On 21 December 1778 he wrote to praise Kilburn's contributions, saying: ‘There is an uncommon taste in his drawing & I often regret he has deserted you’. Kilburn had served an apprenticeship (a period of training for a trade) in a cotton-printing factory in Dublin in Ireland. When he moved to London he continued to sell designs to calico-printers. 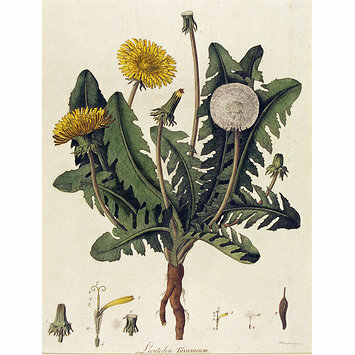 He gave up his work as a botanical illustrator to go back to the textile industry, where he could earn more money. Eventually he owned his own calico-printing factory, for which he designed exquisitely detailed floral patterns. A volume of his designs for textiles is in the V&A collection. 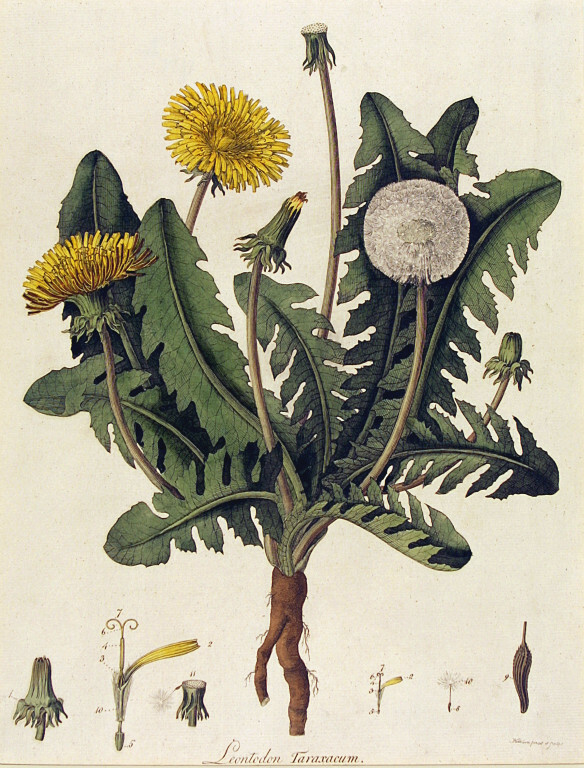 Engraving depicting the dandelion complete with roots, with two yellow flowers, several unopened buds and a white dandelion clock and dissections of the plant parts across the bottom. Kilburn, William. Flora Londinensis. London, 1777-1798.